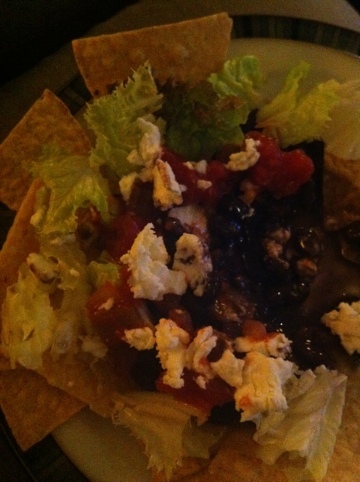 In a desperate attempt to eat up leftover black beans, I made nachos with goat cheese, salsa and lettuce. Not bad and super healthy! Love goat cheese? 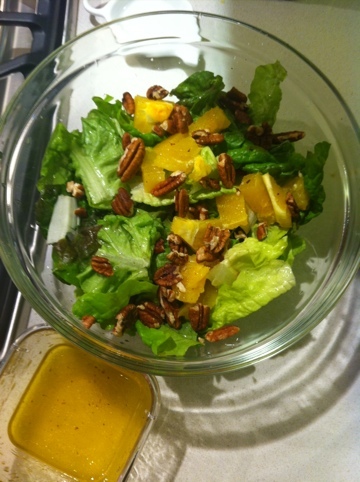 More recipe ideas here. Tonight I searched around for ideas to use the fresh rosemary in my fridge, along with the frozen chicken breasts that made up my last remaining supply of meat. The menu? Chicken breasts baked with red wine, olive oil, fresh chopped rosemary, and salt & pepper – inspired by a Foster Farms recipe. I baked the chicken at 400 degrees for nearly an hour, but it was too dry. I also sauteed spinach in butter, fresh chopped rosemary and salt & pepper, inspired by this recipe; and mashed potatoes (with butter and almond milk). I sprinkled some of the juices from the pan over mashed potatoes. 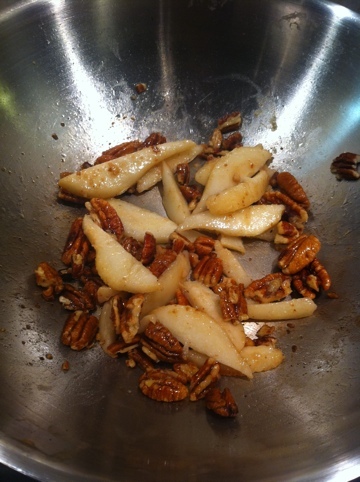 My only regret is that I didn’t make gravy out of the tempting golden bits at the bottom of the pan. Maybe next time! 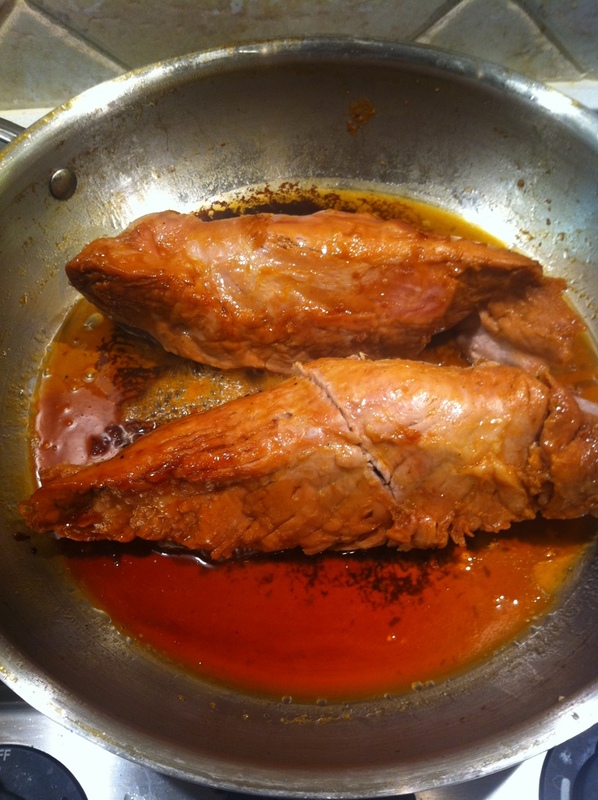 Tonight I simmered pork tenderloin in one inch’s worth of semillon. It produced a pretty golden color and delicious broth. Easy! 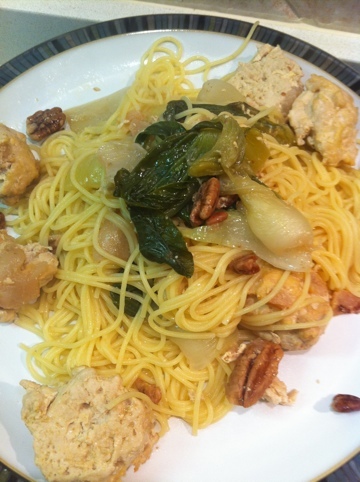 Pasta: Turkey meatballs with pear; bok choy sautéed in pecans and pear, plus chicken stock added towards the end. Add cooked meatballs to bok choy mixture, then combine with cooked angel hair.